Last week I was very excited to receive a Blog on Fire award from Dre from Grackle & Sun. Not only was it my first award of any kind since my primary school years, but it was nice to be nominated by Dre who writes a wonderfully thoughtful blog about all kinds of things that are taking place in her life. The rules of the award are that if you receive the award, you must tell eight unusual facts about yourself and then share the award with eight of your favourite bloggers. I’ll start with the blogs, as that is the fun, although not a very easy, bit. With so many great blogs around, how can I nominate just 8? To make the task easier for me, I thought I’d focus on blogs that have something to do with dyeing (although not necessarily exclusively so). As any newby dyer, at the moment I am feeling like a sponge that just wants to absorb all the information I possibly can about the topic. So many dyers write incredibly detailed and informative posts about their dyeing experiments, and these posts are so essential to my own learning process. 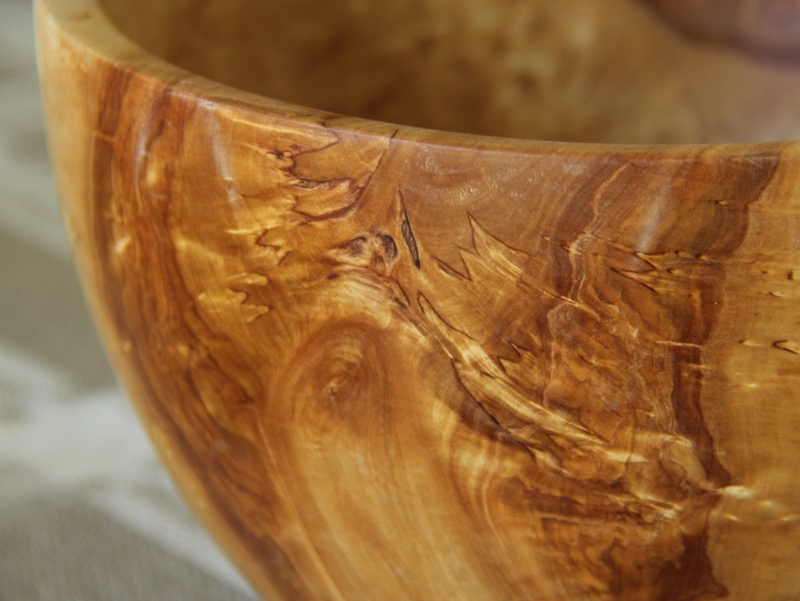 Many bloggers on my list of course write about much more than dyeing, but whether specialising in one topic or writing about a great variety of things, I always get inspired and informed by their writing and photographs. 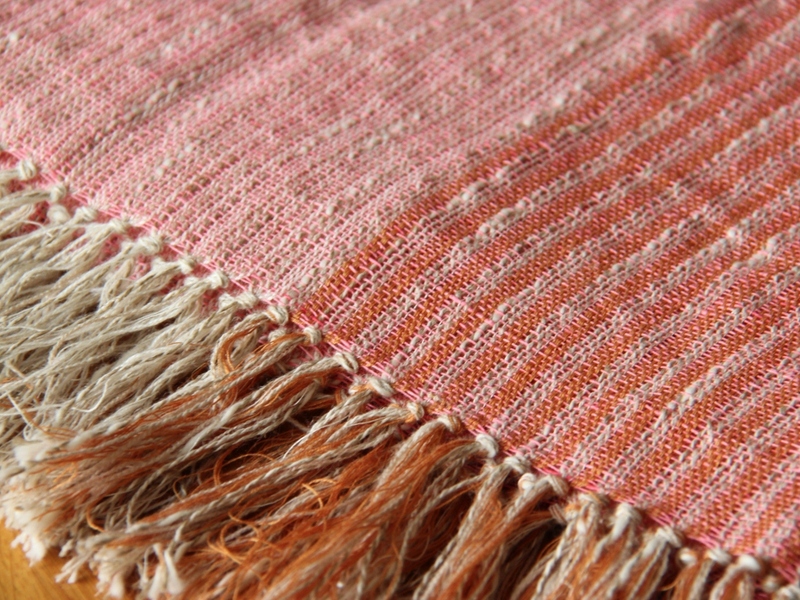 Most dyers will of course know this blog and her fantastic books about natural dyeing. Without her work, I just wouldn’t know half as much about dyeing as I do now. This is one of those blogs that I intend to read all the way from the very beginning. Leena Riihelä is another one of my dyeing gurus who, like Jenny Dean, shares her vast dyeing knowledge in a blog that is a must-read for any natural dyer. I particularly enjoy the fact that she writes in both Finnish and English, which allows me to keep up with my Finnish dyeing vocabulary, especially plant names. In addition, her colour work knitting designs are just beautiful. Helen lives in Wales where she grows her own dye plants and creates wonderful landscape art from felt. I always love seeing pictures of her dye garden in her blog – a real inspiration for my own dye garden! Without knowing it herself, Helen is, like the two ladies above, one of my trusted dyeing teachers. It’s not just her blog I learn from though. She is an active member of the Online Guild of Spinners Dyers and Weavers, so this is partly to thank her for her generous sharing of knowledge, tips and advice on that forum. It was Dre who nominated me for this award, but I am not nominating her back just out of politeness, I truly enjoy her writing – her curious mind is always full of interesting thoughts, and whatever she happens to be thinking about, she researches with incredible thoroughness, so you always learn something interesting from her posts. Pia lives in a very idyllic farm house in rural Denmark. As well as looking after her menagerie of very sweet looking pets, she writes about her numerous artistic endeavours, dyeing being just one of them. This blogger doesn’t just write about dyeing: as the name suggests, she loves textiles in all forms. We share so many interests it is just uncanny, whether it is fabrics, fibers, quilting, nature, history, gardening or photography. 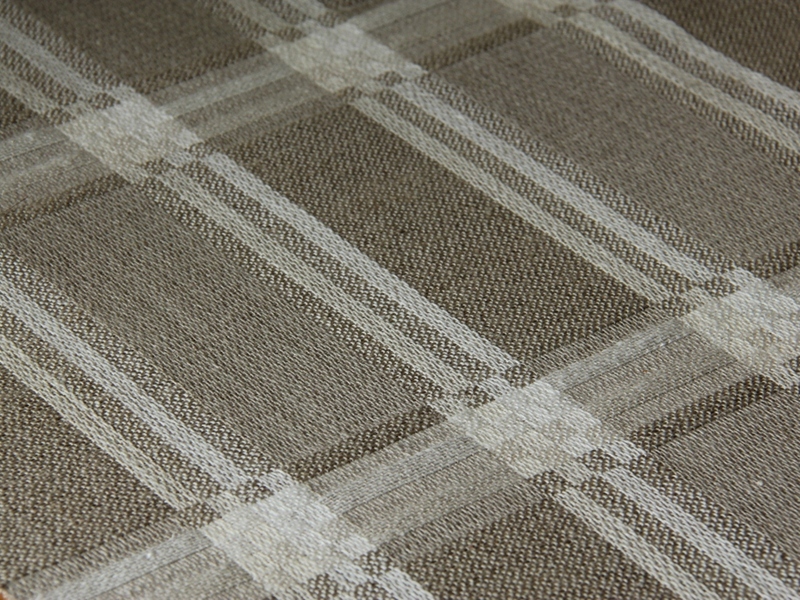 I particularly love her posts about historical textiles. This is very much a natural dyeing blog, although in reading about her crafty activities you get lovely glimpses of her life in the Texas hill country. Like many other writers on this list, Deb writes thorough and informative posts about her dyeing experiments, with lots of inspiring pictures that show the effect of all those variables that dyers can play with (for example, I just loved her recent post that showed what a different range of greens you get if you over-dye yellow yarns with indigo, as opposed to over-dyeing indigo yarns with yellow – exactly the kind of experimentation that I am interested in but just haven’t got round to doing yet). This blog is not so much about dyeing (although she does do that as well), but more about knitting, crochet, spinning and general craftiness, as well as the adventures of her cat Raymond. She is currently on a blogging sabbatical, but I am giving her this award in the hope that she might one day come back to blogging – I miss her cheerful and charming posts and inspiring pictures full of vibrant colour. So that was my list. Thank you all for both inspiring me and sharing your knowledge! 1. I am a serial student and have three degrees (so far). And if an opportunity arose, one day, I’d love to go to an art school. 2. I love flamenco dancing. 3. Although I spent most of my childhood in Finland, I have lived in several other countries: in Israel, Cyprus, the Netherlands and now in the UK. 4. I am good at ice skating. 5. I started life in a slightly unusual way, being a premature baby and being born feet first with the umbilical cord wrapped around my neck. Maybe, already at such young age, I thought that the conventional method (although admittedly much more sensible and easier) is just not “me”. 6. I used to play the bass guitar (until I realised much to my sadness that really, I am not very musically gifted at all). 7. Because there are so many interesting things in the world, I am not very good at sticking to any one thing and so I still haven’t quite decided what I want to do when I grow up. 8. I never refuse chocolate (ok, I admit, I am running out of unusual facts). 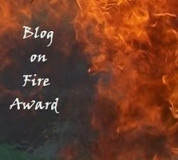 Categories: Random | Tags: Blog on Fire award, great blogs about dyeing | Permalink. I have just come back from a very special summer holiday. No, it wasn’t a luxury holiday to some exotic location, it was a trip back home to Finland. What makes it special was the fact that I have not been back home for five years, which is a pretty long time considering I used to go back 3-4 times a year. It’s not that I haven’t wanted to go back, but I have been too ill with my M.E. (Chronic Fatigue Syndrome) since 2007 to travel long distances. It was wonderful to finally be able go back home and see my family, friends and relatives. It was also great to notice that I really am gradually getting better (even if the progress feels way too slow a lot of the time) and able to do things I have not been able to do for a long time. In addition to all the socialising, I did manage to squeeze various arty and crafty activities to my holiday. Hugh and I spent 5 days in Helsinki, the capital of Finland by the Baltic sea, enjoying the summery vibe of the city. The weather was great and we spent a lot of time sitting in parks and cafe terraces, watching the world go by. 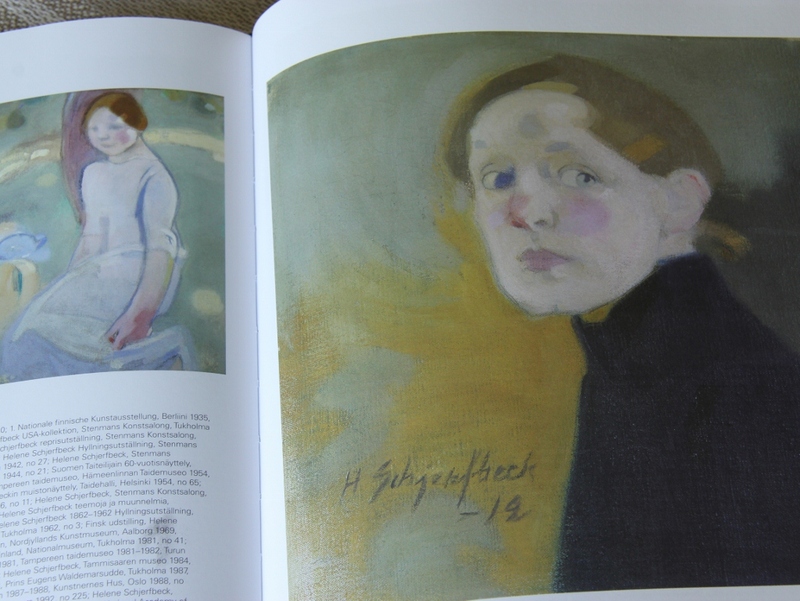 The absolute highlight for me was an exhibition of art by Helene Schjerfbeck, one of my all time favourite artists. This year is the 150th anniversary of her birth, and the Ateneum art museum in Helsinki had put together a large exhibition of her work. Although there were many good female artists painting at the end of the 19th century and the beginning of the 20th (the “Golden Age” of Finnish painting), at the time their work was was often overshadowed by the work by their male colleagues’ such as Albert Edelfelt and Akseli Gallen-Kallela. 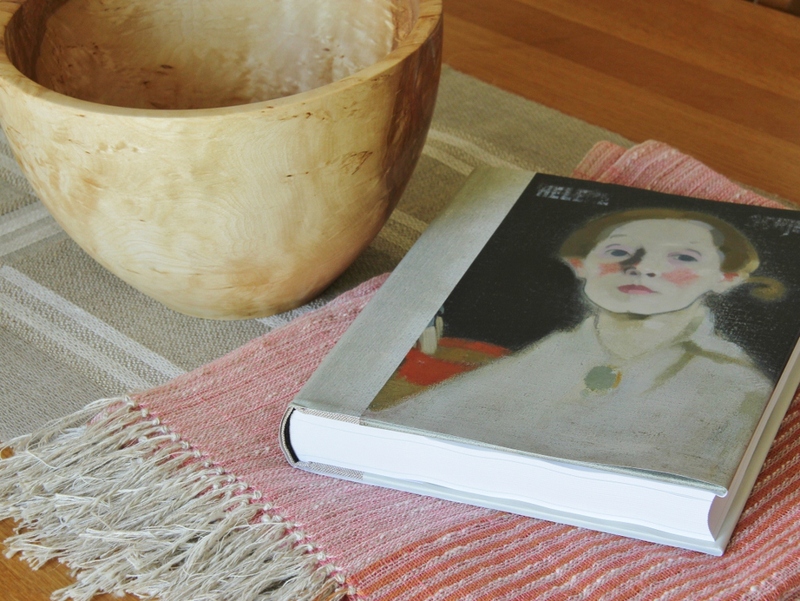 Despite this, Helene Schjerfbeck developed her own unique style, and these days her work sells for huge amounts of money at places like the Christie’s. She also suffered from poor health and fatigue, which often meant she could not paint as much as she wanted to, a feeling I can definitely identify with. I highly recommend this exhibition, if any of you just happen to be in Helsinki this autumn. And if you are interested in Finnish/Scandinavian mid century design, particularly in glass and textiles, make sure to visit the Design museum which has an exhibition on about Finnish design 1947-1965. The second half of the holiday was a more rural one, spent at my mum and dad’s summer cottage in Tammela, near the town of Forssa. There were boat trips across the lake to pick some wild blueberries (one of my favourite activities that I always miss here in the UK), barbeques and baking sausages and pan cakes by the camp fire in the evenings. 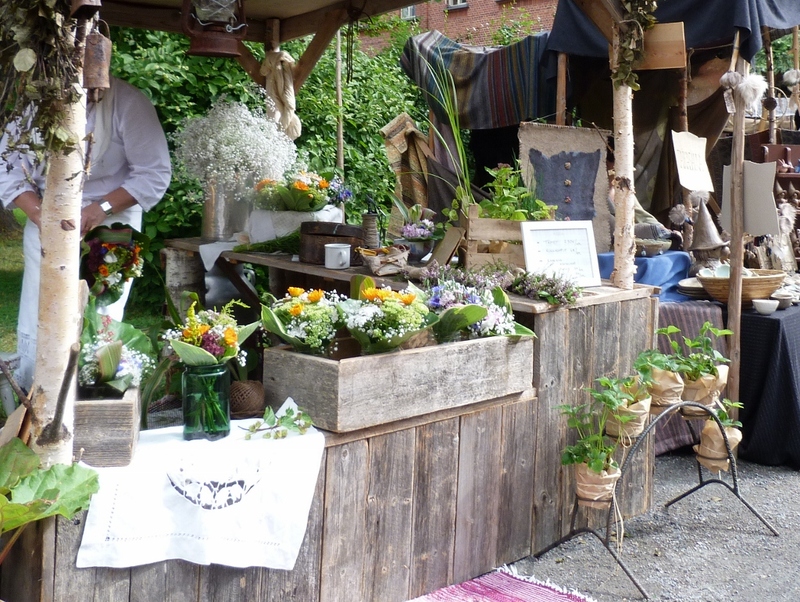 We also visited the wonderful craft fair “Hakkapeliittamarkkinat”. It’s a very popular local fair, which commemorates the 30-year war in the 17th century and the light cavelry men from Tammela who went away to fight for the King of Sweden Gustav Adolf (Finland was part of Sweden at the time). 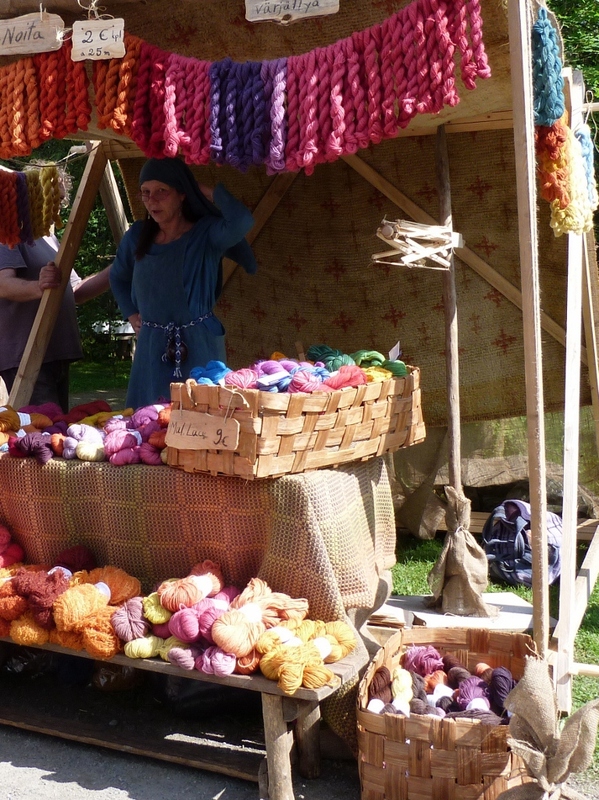 In addition to the historical re-enactment, there were lots and lots of craftspeople selling their products like naturally dyed yarns, hand-woven blankets and tablecloths, pottery and woodwork, handmade soap and many other things. I was particularly interested to see the stallholders who were doing spinning demonstrations or just spinning to pass the time between selling. 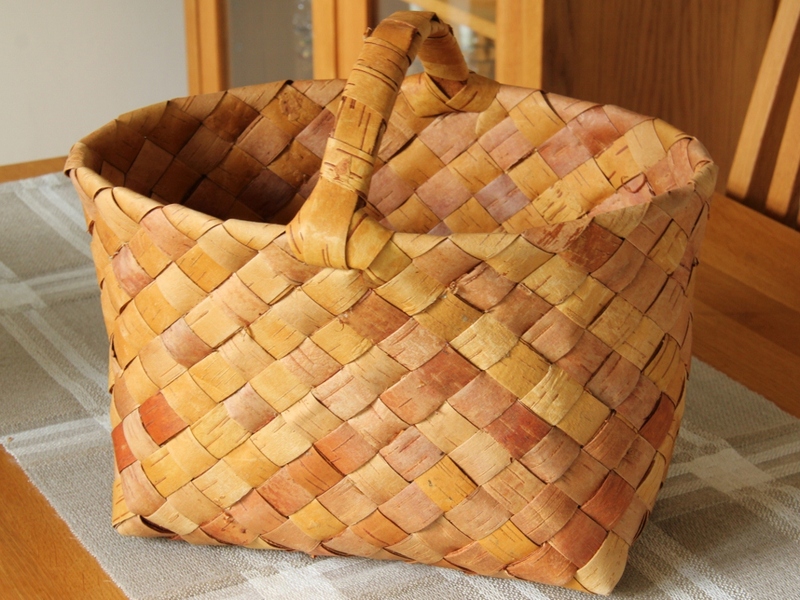 I found myself a new knitting basket made of birch bark (a very traditional material as we have a lot of birch trees) and a hand-woven linen table cloth and a linen towel. 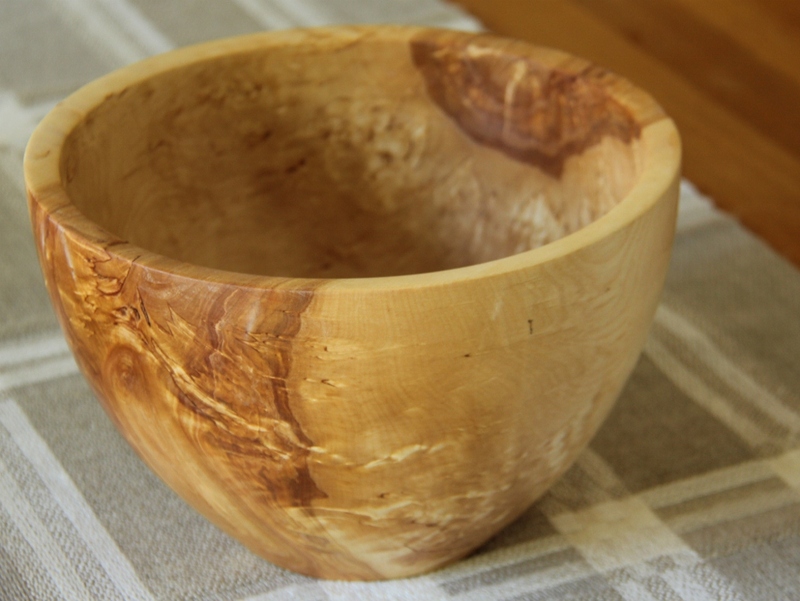 Hugh bought a couple of beautiful wooden bowls which, we think, are made of “visakoivu”, a sub-species of birch which has a particularly strong patterning in the wood. 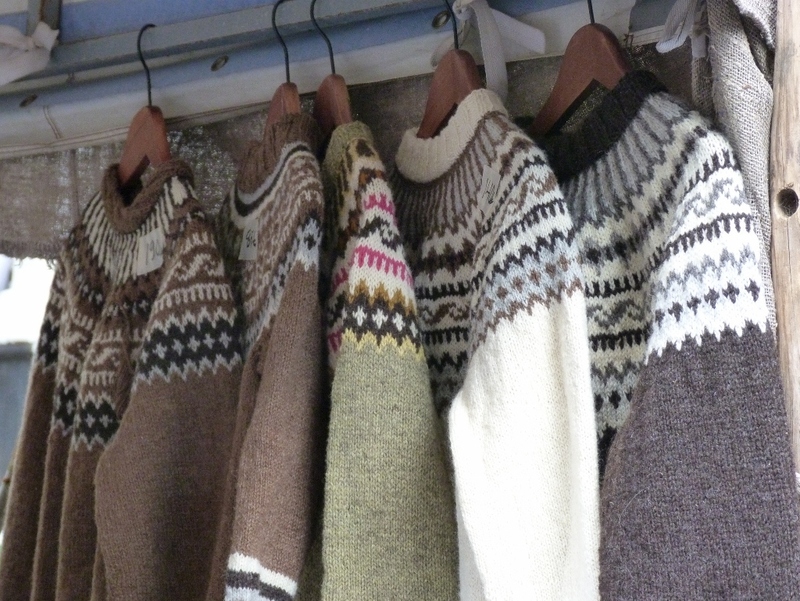 Now I hear you say “never mind what you got up to during your summer holidays, enough of that, all we want to know is what were you knitting?” But I think this post is getting far too long already, I promise I will write about the holiday knitting in my next post. Categories: Random | Tags: Finland, Finnish crafts, Hakkapeliitta craft fair, Hakkapeliittamarkkinat, handmade, Helene Schjerfbeck, Helene Schjerfbeck exhibition at the Ateneum art museum | Permalink. 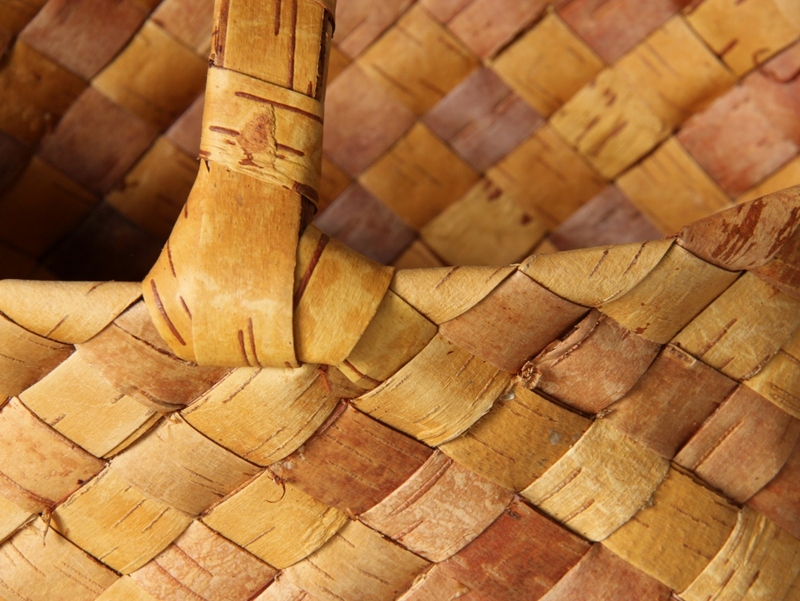 I am a big fan of all things Japanese, particularly food, fabrics, arts and crafts. 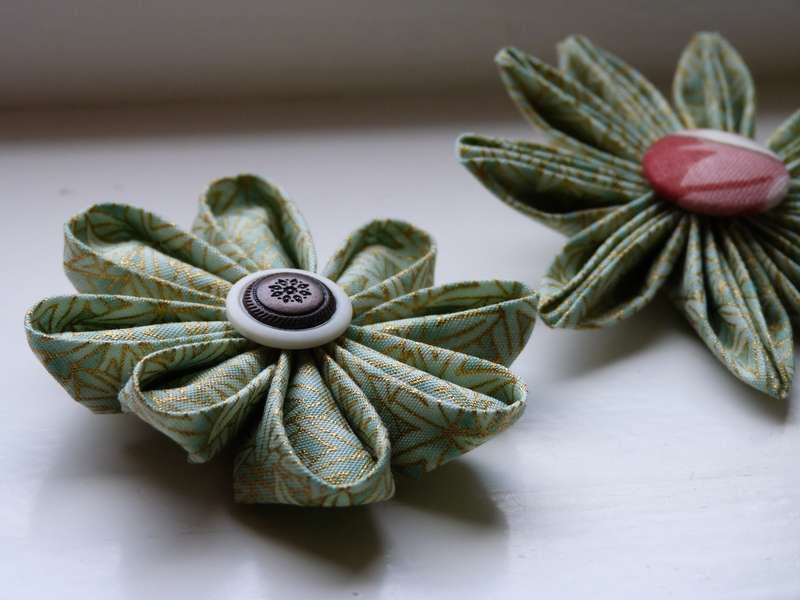 So when I read about making Kanzashi flowers in the iMake blog, I knew I had to have a go at making them. 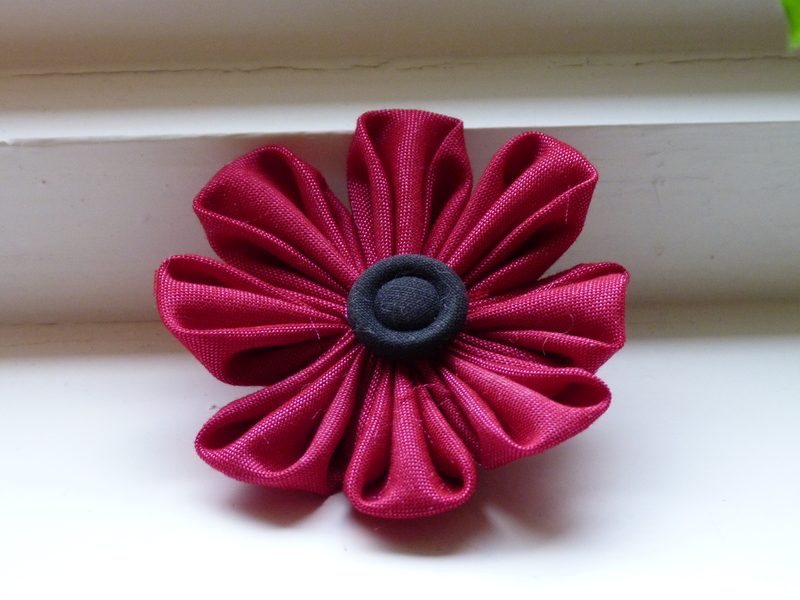 For the instructions, I bought the “Kanzashi in Bloom” book by Diane Gilleland. 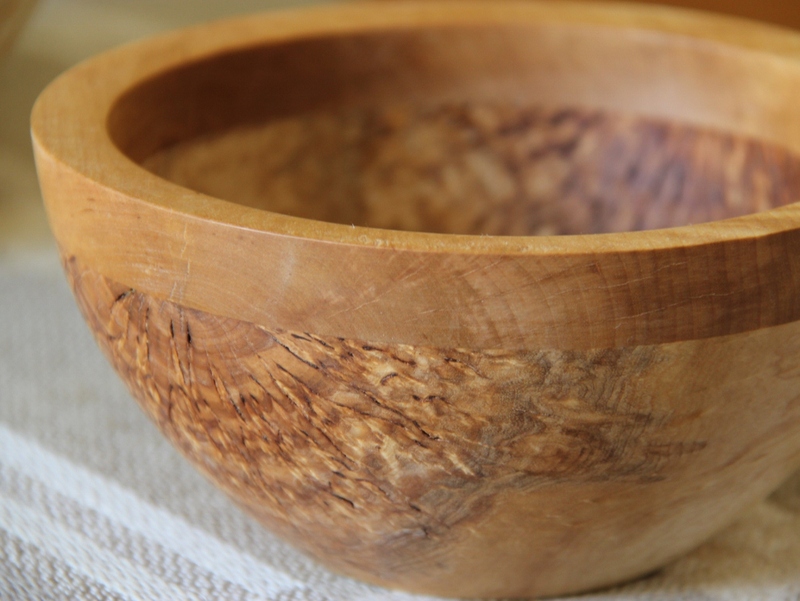 The process was suprisingly easy – the instructions in the book are very good – but you do need nimble fingers and a bit of patience. I made them at the end of last week, just before I heard about the tragic events of the earth quake and the tsunami. Since then I – like everyone else – have spent a lot of time listening to the terrible news and thinking about the sad stories of people who have just disappeared in the waves. So it seems entirely appropriate to post the pictures of my Kanzashi flowers and spend a moment thinking of the people of Japan and what they are going through at the moment.